What is Isaac Newton's Mini Golf? It's an in-classroom lab designed to help teachers and students explore science through miniature golf. Watch the video below to see it in action and then check out our product page here to learn more about the lab kit and how to order. 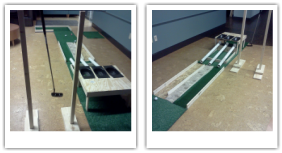 Here at Isaac Newton's Mini Golf, we believe that learning science and math can and should be fun, hands-on, and active. That's why we created an interactive learning system, complete with lessons plans, for teachers and students to enjoy.